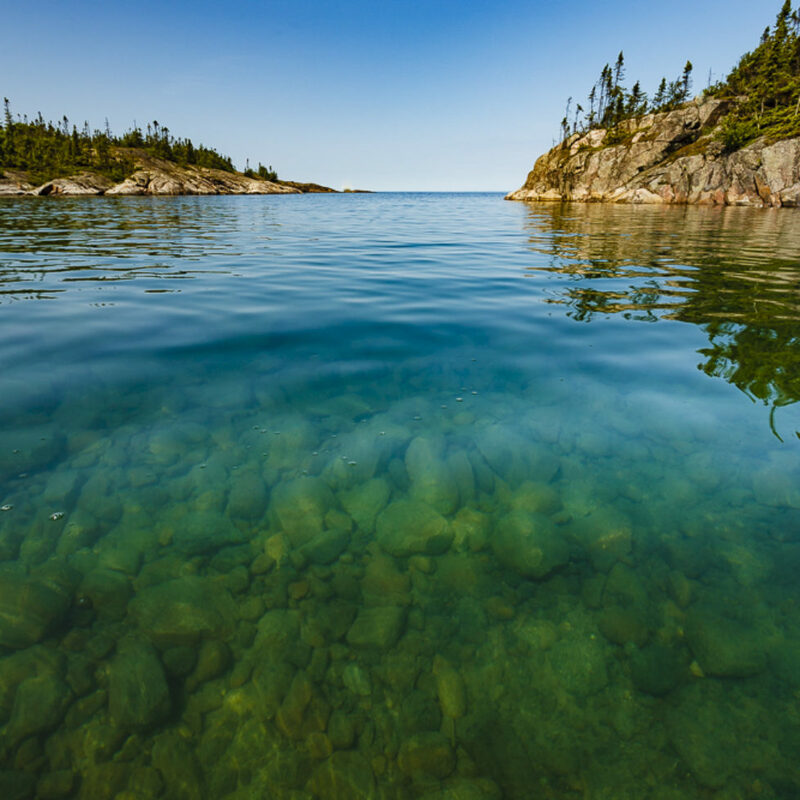 According to scientists, areas of the Great Lakes are littered with concentrations of plastic waste that matches or exceeds that the oceans’ most infamous masses of floating garbage. 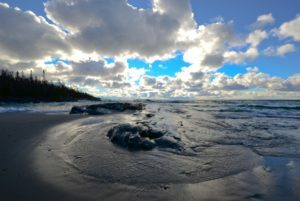 While the majority of these ecology-altering eyesores are located adjacent to population centres in the lower Great Lakes (one study estimated that Toronto’s Don River along contributes a whopping 650 kg of plastic trash per year to Lake Ontario), Lake Superior has not escaped the plastic scourge. Shoreline residents know that floating plastic junk is nothing new. 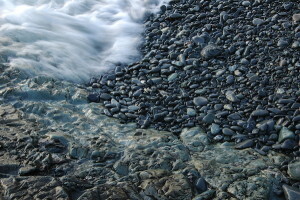 It’s been washing ashore since humans became addicted to the stuff in the wake of World War II. 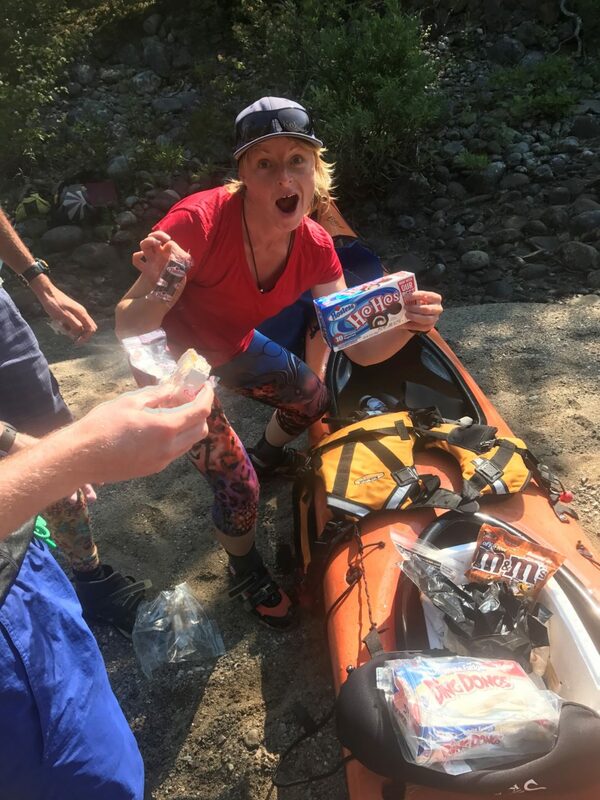 For 25 years, Naturally Superior Adventures guides have collected plastic flotsam from wilderness shores, including countless balloons, potato chip bags, twist ties and pop bottles. 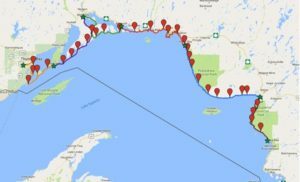 We’ve volunteered in shoreline cleanups of Michipicoten Bay, where we scoured Driftwood Beach for plastic bags and cigarette butts. 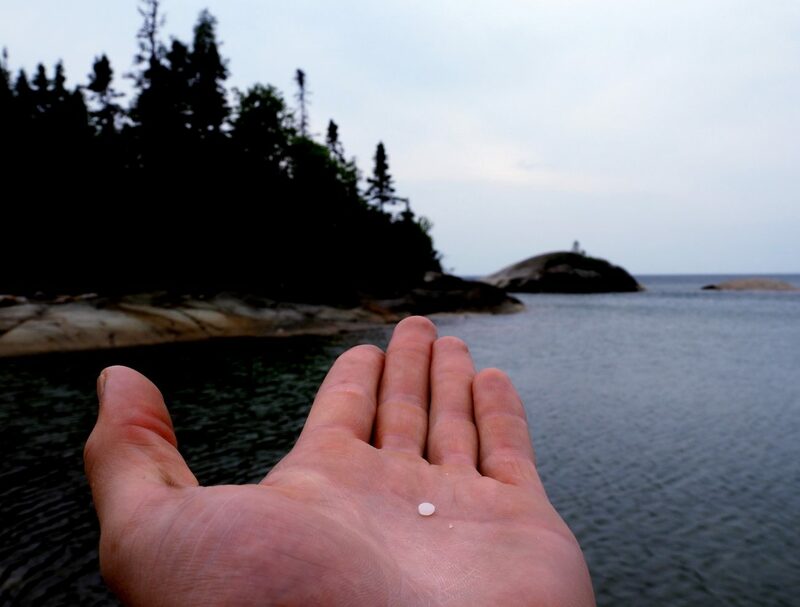 Lately, guides have documented the arrival of nurdles — plastic beads used in the construction of rotomolded sea kayaks, among other food-grade applications — radiating across hundreds of kilometres in the decade since a 2008 derailment on the Canadian Pacific Railroad on Nipigon Bay. 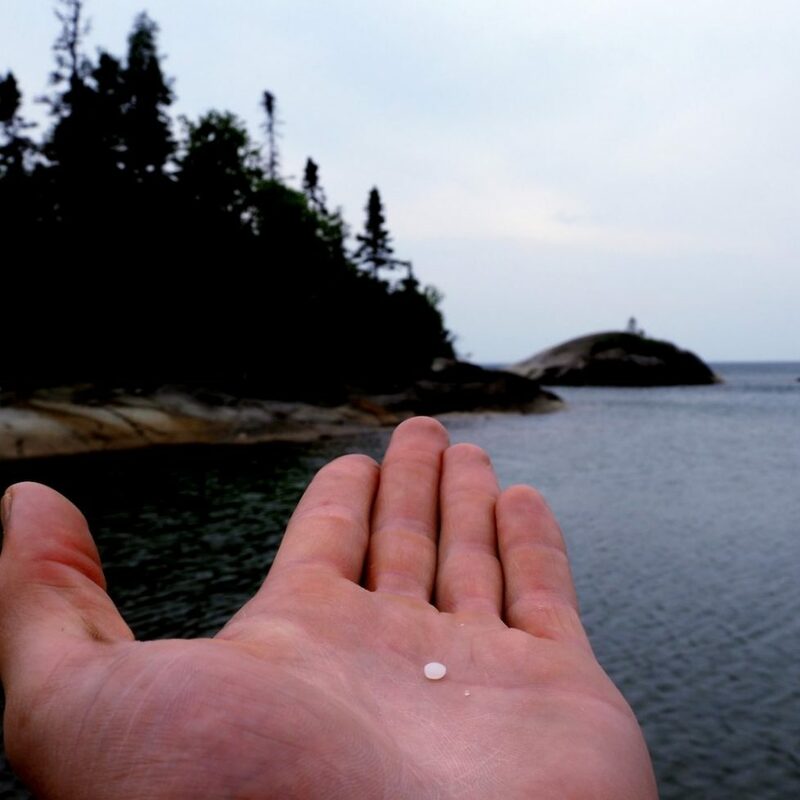 Last summer, NSA’s Jake O’Flaherty collected the lentil-shaped pellets at numerous campsites on the Superior Highlands and Pukaskwa coastline, including McCoy’s Harbour. Like many environmental problems, plastic is a paradox. In everything from medical equipment to fleece sweaters and kayaks, these molecular chains of hydrocarbons have improved our lives with lightweight, durable products. But durability is also plastic’s achilles heel. 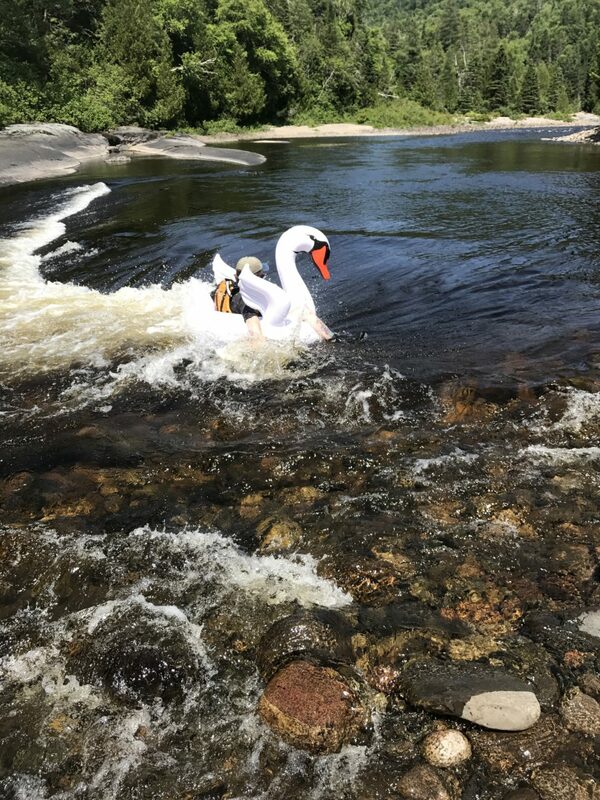 It’s slow to breakdown and when it does, tends to decompose into smaller and smaller particles—known as microplastics—which fly and float through the environment in near-perpetuity. 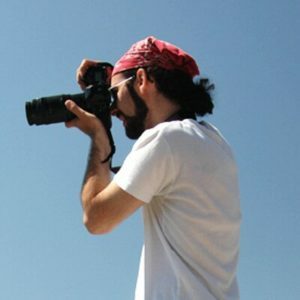 Researchers are just beginning to document the impacts of ingested microplastic on fish and wildlife (from torn intestines to tumours, the results are pretty); and a the results study released in October 2018 demonstrated that our own guts are likely laced with the stuff. What’s more, we do a terrible job of recycling the plastic. Only 8 per cent of plastic in Ontario is recycled. It seems like the feel-good notion of recycling simply gave manufacturers the social licence needed to create more plastic. Slowly, things are changing. No one denies that plastic waste has emerged has a global problem. Jurisdictions around the world are banning single-use plastics. Like so many others, we’ve endeavoured to reduce our dependency on the stuff at Rock Island Lodge. 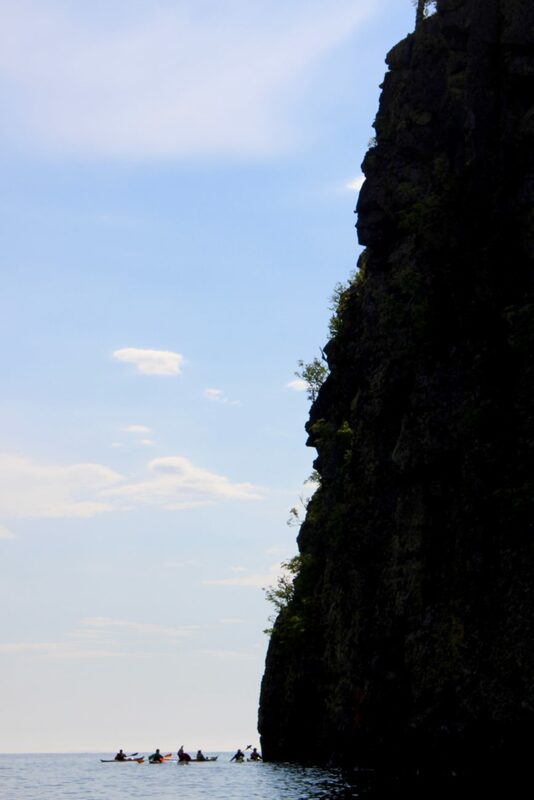 Action is the best antidote to despair. 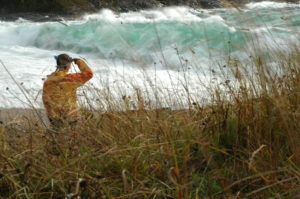 We’re certain Naturally Superior guides will continue to return with beachcombed flotsam in their kayaks’ hatches. 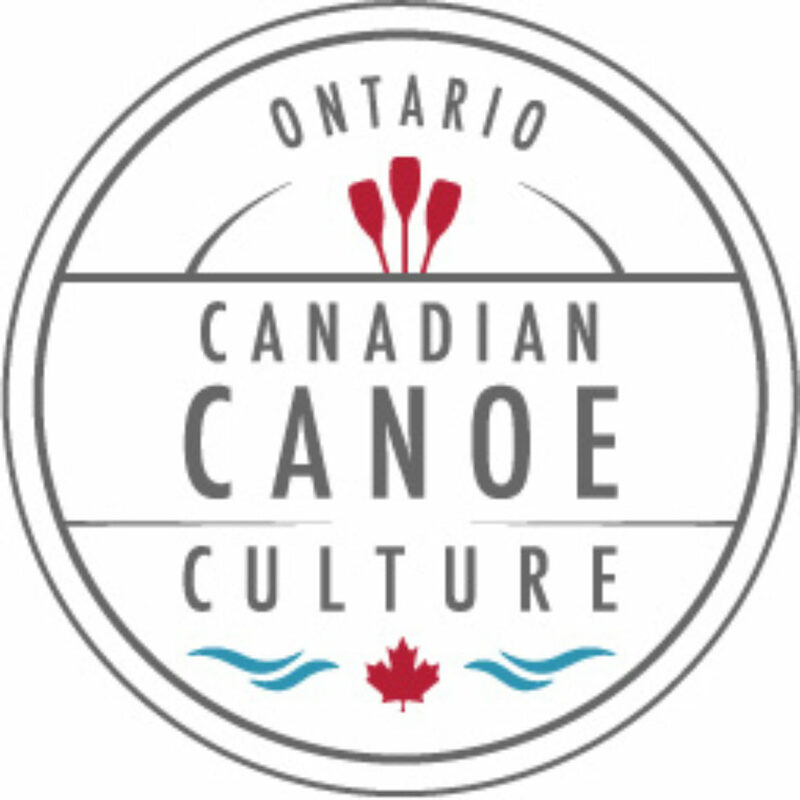 What better way to take part in this intriguing and uplifting vision of Canada then to set off this summer on a journey by canoe? 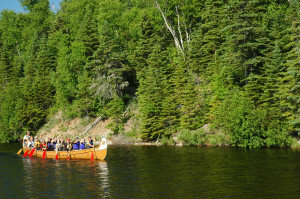 Better yet, make your trip in a voyageur canoe, the historical vessel of the Canadian fur trade, in which individual paddlers come together in one boat to achieve a great goal. 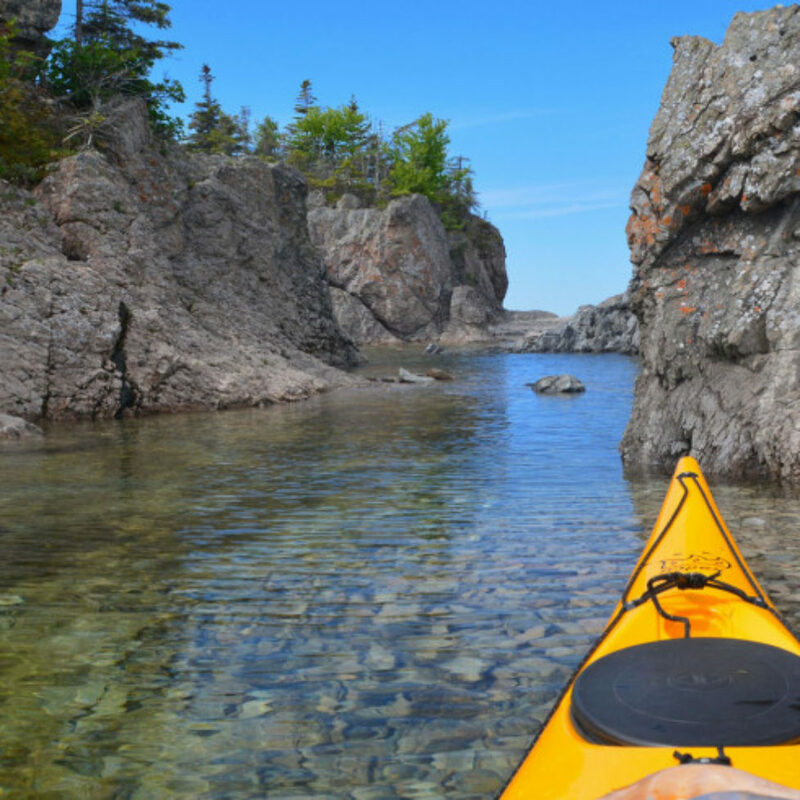 Naturally Superior Adventures is excited about the 2017 Voyageur Canoe Brigade as a means to recreate the voyageur experience and commemorate Canada’s cultural heritage on Lake Superior’s wilderness coast. The fur trade was Canada’s first industry, starting in the mid-1700s and lasting nearly a century. 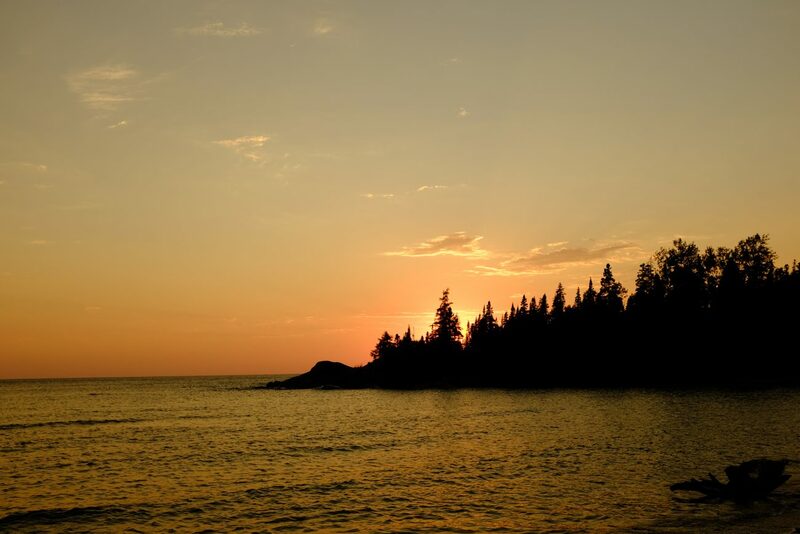 It relied on trading posts scattered throughout the north country to gather fur from trappers. 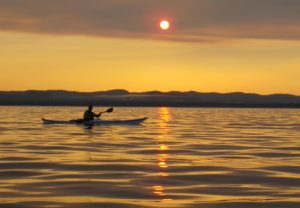 The Northwest Company recruited young paddlers to pilot brigades of big 26- to 36-foot birchbark canoes across the country. 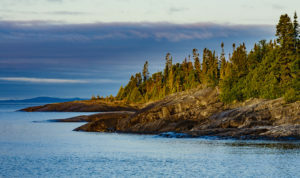 The voyageurs were like long-haul truck drivers, delivering trade items like beads, metal pots and muskets to trading posts and returning to Montreal at summer’s end with canoes brimming with valuable furs. 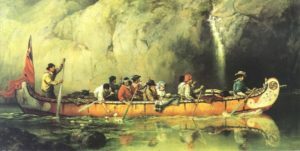 For their exploits they emerged as early Canadian folk heroes. Our voyageur canoe is a 36-foot fibreglass replica of a canot-du-maitre, the fur trade canoe traditionally used on the Great Lakes. 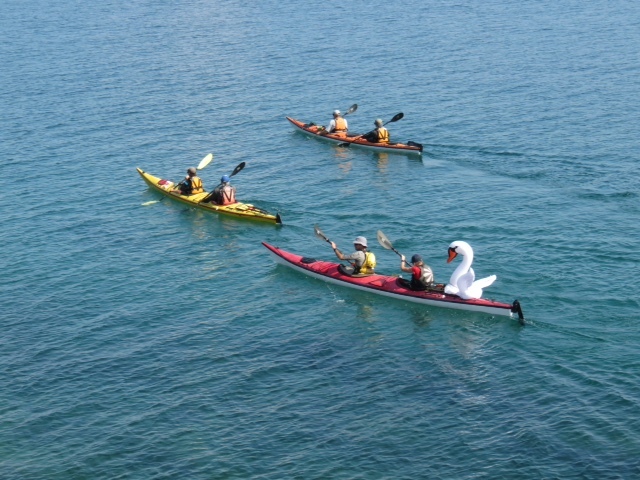 It’s about the length of a school bus, propelled by 10 to 16 paddlers and designed to be stable and seaworthy in waves. 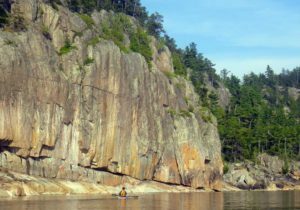 Most importantly, in the fur trade days and now, it’s capable of holding up to four tons of cargo—a valuable asset since the five legs of our journey from Agawa Bay to Thunder Bay range from 5 to 10 days of wilderness paddling. Ultimately, the voyageur era ended before Confederation. Fur lost its fashion appeal in Europe in the 1840s, just as the construction of locks on the St. Lawrence Seaway made freight canoes obsolete in favour of large ships. 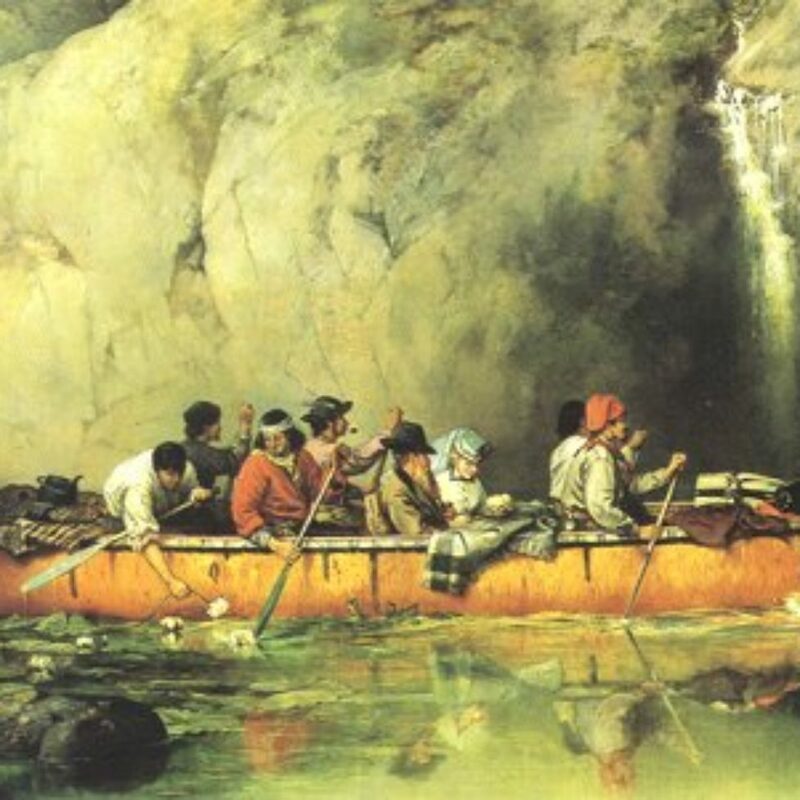 But the image of hardy, wilderness travellers—the voyageurs—remained as a pillar of Canada’s vibrant canoe culture. 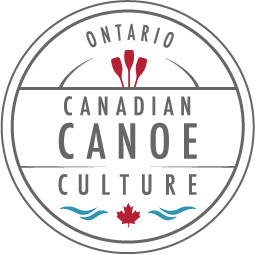 This summer, Naturally Superior Adventures is honoured to wear the badge of Ontario’s Canadian Canoe Culture program. 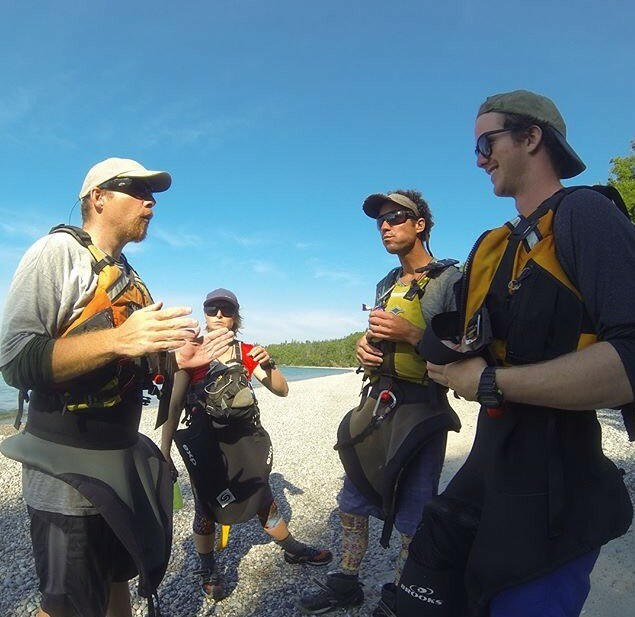 We believe in the canoeing’s values of personal challenge, wilderness exploration, making real connections, sharing knowledge and being proud to be Canadian. 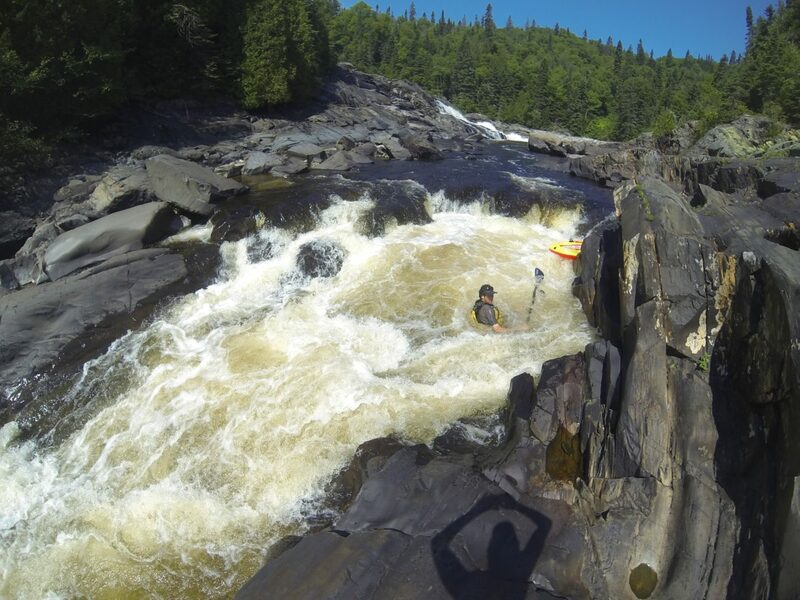 Pick up a paddle and share your experiences on Ontario’s myriad waterways with the #paddleon hashtag.